Goooo, little guy! How exciting! Happy Monday, FG & friends! btw, clicking on the pic to see a larger image results in an error. Oh, he was having a blast checking everything out. And you wouldn't believe how soft he is! I can't believe he's outside already. I guess I was thinking that they would be like puppies or kittens but that would not be very evolutionarily sound. I would love to just squeeze him and see how soft he is. I love how they have to stan all spraddle-legged when they're that young, just to stay on their pins. Adorable. :0 ohhhh, I WANT HIM!!!!! Aarrggh! Can a person die of cute overload? He's just begging to be scushed! He is so cute!!! I just love him Farmgirl! Yeah! That is wonderful. Too cute! I saw this today, as I was taking my mom to the dentist. They raise lamb for restaurants, but they also, apparently, rent out their sheep to "mow" people's fields. You can put that little guy right to work, earning his keep! 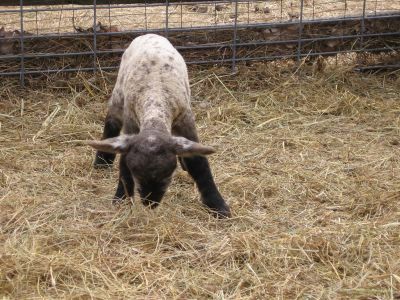 It never ceases to amaze me how (for lack of a better term) grown up and independent baby lambs are. I mean, they are born (with little hooves, wool, big ears--everything fully intact) and literally within minutes are standing up heading for the milk bar. An hour later they are bouncing around (or napping). In this series of photos, the second one was taken when she was about 30 minutes old. The top photo when she was 3 hours old, and the bottom two photos the next morning when she was about 14 hours old (and already bigger than when she was born!) They grow so fast. LOL, I'm not sure what 'scushed' is, but I've probably done it to a lamb or two! P.S. Don't die now. We're only at the beginning of lambing season. Think of all the cuteness you'll miss! Oh, that Wooly Weeders place is too much. Mowing vineyards--what a great idea. Ha ha I love the phrases they use, like "environmentally friendly mowing service" and "noxious weeds are our specialty!" Thanks so much for the link--and the smile.